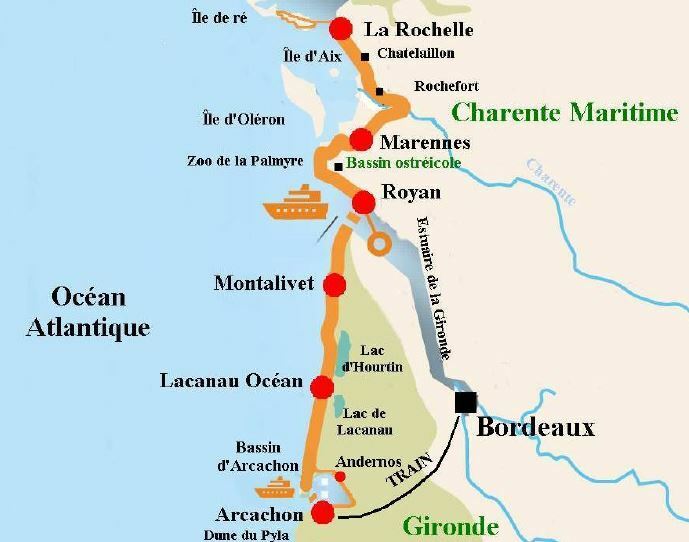 Starting from La Rochelle, come and discover La Vélodyssée, elected best cycling route in the Charente Maritime, discover many islands: island of Ré, island of Aix, but also long sandy beaches, marshes, oyster basins ... Continue your bike trip in the Médoc, along the Atlantic coast! You will wander in the most beautiful seaside resorts of Nouvelle Aquitaine: Soulac-sur-Mer, Montalivet-les-Bains, Hourtin, Carcans ... to reach the salty meadows, oyster ports typical of the Bay of Arcachon basin! You will be warmly welcomed every night in 3 and 4 star hotels and charming bed and breakfast. Arrive at your 4-star hotel in La Rochelle, where you will find the road book and bikes waiting for you. La Rochelle is a lively city, remarkable for its history. You will appreciate the old harbour and its towers which kept the entrance from XIII century to XV century. You may also enjoy the city centre with its streets with arcades, and the oldest French town hall (15th century). Tour the island of Ré, passing through the villages of Flotte en Ré (18th century) and its fishing boats, Saint-Martin with its fortifications and fortress. Walk along the oyster beds, salt marshes and the nature reserve of the “Lilleau des Niges”. Back by “La Couarde sur Mer” and “Le Bois Plage en Ré ”. Today’s cycle alongside the coast and through the lively cities of Châtelaillon-Plage and Fouras. Then continues via the nature reserve of the Marais d’Yves. In Fouras, possibility to take the ferry to the Island Aix and to visit this small island where Napoleon spent his last days on French soil. Before arriving in Marennes the path takes you through Rochefort founded in the 17th century as a place of "refuge, defense and supply" for the French Navy. The Arsenal served as a naval base and dockyard. A unique transporter bridge with its steel structure (similar to the Eiffel Tower) is magnificent. This bike paths follows the most beautiful coast of western France. You itinerary takes you on a cycle path through the pine forest of the wild coast, La Palmyre where you can visit the zoo. You will arrive in Royan by Saint-Palais-sur-Mer, the beaches of Vaux-sur-Mer, Pontaillac and its marina. This stage marked by the intoxicating smell of maritime pines. Royan is a modern resort city that hides some beautiful villas of last century, an original covered market and a festive and lively waterfront. From Royan come and sail with your bike on the estuary and join the Medoc coast! From the tip of the Verdon you will cycle on a pleasant bike paths to reach the charming seaside resort of Soulac. Explore beaches and ocean, as far as the eye can see. Accompanied by the scent of pine trees you continue till Montalivet, small peaceful sea side resort between forest of the Landes, ocean and marshes. Continue your journey south towards Lacanau Océan! Here La Vélodyssée follows a cycle path in the middle of the pines, between lakes and oceans. In the vicinity take a break in Hourtin, where is the biggest lake in France. “Lacanau-Ocean” in the Médoc Ocean region, where cycling is a way of life and much appreciated for its long ocean beaches sheltered by dunes and forests, its lakes and the unspoilt natural areas. The seaside resort is also famous for its surfing area. Its early 20th century villas bear witness to a rich past. From “Lacanau-Océan” ride only on cycle path and discover the widest wild beaches of the Aquitaine coast; Le Porge-Ocean has a wide beach of 13 km without any construction. To enjoy it, leave from time to time the cycle path. Never far away from the shore line, continue through a beautiful itinerary towards the Cap Ferret or the Baie d’Arcachon *. Finish your cycling day through typical oyster villages of the Baie d’Arcachon and re-join by ferry the renowned seaside town of Arcachon. *For those who wish to fully enjoy the Baie d’Arcachon and its typical ports it is possible to spend an extra night around Andernos and to continue the cycling tour the next day around the Bay to the iconic city of Arcachon. *The Arcachon Bay, is since the middle of the last century the world of the oyster! With its 84 km of beaches surrounded by pine trees, it is an original and special place, unique on the French coast! Situated between the Côte d’Argent and the Côtes des Landes, the Bay has an enjoyable climate with a perfect sunshine all year long. Breathe the sea air, the perfume of the pine trees and mimosas. Todays will take you around the Arcachon Bay, what a pleasant stage. Follow La Vélodyssée which runs along an old railway line and little roads to explore the Bay of Arcachon. Discover the surrounding towns and small ports, enjoy the splendid views over the bay and observe the many species of birds. Come and discover La Baie d’Arcachon, the winter town and its sumptuous villas from the second empire, its churches, its walks alongside the Bay and its ports. Arcachon will no longer be a secret for you! You can choose to follow the cycle track along the coast up to the Dune du Pyla and climb the 117 metres of sand dune, highest dune in Europe. Exceptional scenic view from the top of the ocean and the pine forest Loop tour. Transfer of the luggage at every step.